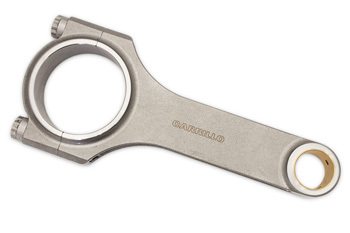 In 1963, Fred Carrillo set out to manufacture the finest Connecting rods available, and today, Carrillo is still a leader in the field. Forged from "Carrilloloy " a proprietary alloy blend of USA sourced ingredients; Carrillo's Rods start off different. As a billet of Carrilloloy they are worked into a forging using the latest technology, enabling Carrillo to dictate the grain flow they want to see for the best strength to weight ratio. Each con rod is then heat treated, and subjected to rigorous material tests ensuring forgings are of the highest quality, with world class precision. Now at a better price than ever! VAC Works closely with the Pankle family of race products including Carrillo & CP Pistons. This ensure you optimal fit and fitness to your application including critical specifications like HP & Tq output, RPM, Stroke, Weight and more. Don't just take our word for it; Carrillo is found in winning race engines of all types around the world.